Welcome to Bodies: A Tool, A Weapon, A Gift or a Possibility! At what age did you give up your body as a great tool? What is Bodies: A Tool, A Weapon, A Gift or a Possibility? 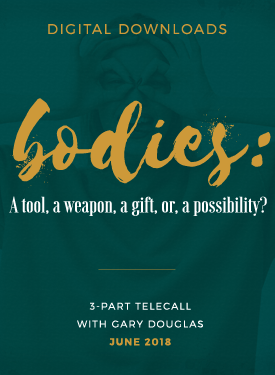 Enjoy this very special telecall with Gary Douglas inviting you to the GIFT and the POSSIBILITY of bodies. "What would you like your body to be that you’re not allowing it to be that if you would allow it to be it would engage all the elementals to contribute and create it?" Is now the time to engage the elementals in the creation of your life, with your body?